Tunnel machine Bertha is about to finish its passage below the Alaskan Way Viaduct and take a four-day rest break after workers ran the machine 24 hours a day for more than a week. Tunnel-boring machine Bertha and its crew will begin a short break Tuesday, after digging under the Alaskan Way Viaduct without damage. Officials made that announcement after the state reopened the elevated road Sunday to traffic, nearly 10 days after the drill began what was estimated to be a 14-day shutdown. Bertha had covered 342 of the 385 feet of the viaduct segment as of 11 a.m. Monday, and the viaduct wasn’t showing any movement. By late Monday or early Tuesday, it should reach 385 feet. At that point, concrete rings will be fastened under the viaduct and the machine can stop for maintenance. “We’ve passed the most critical foundations,” said Chris Dixon, project manager for Seattle Tunnel Partners (STP). 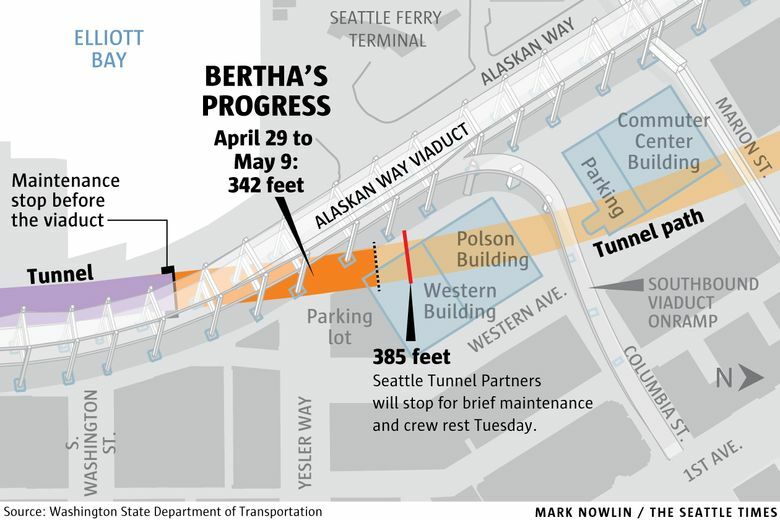 Bertha’s cutting end has passed beneath four columns, including one at Yesler Way, whose foundation pilings came within 15 feet of the tunnel route. “We’re basically in the homestretch and everything’s OK,” Dixon said. The machine has been grinding virtually 24 hours a day since April 29 and is expected to stop for roughly four days. “The main thing is to give the crews a break. They’ve been working these 12-hour shifts that will be 11 days; that’s a pretty long stretch,” Dixon said. When drilling resumes, crews will revert to a normal schedule of two 10-hour shifts and a 4-hour maintenance break every day. After grinding out of a concrete maintenance stop, Bertha covered about 40 feet per day, a desirable pace that would meet STP’s goals this year. “The deeper we get, the farther away we get from everything, the better the soils we get into,” Dixon said. Some positive signs emerged last week, when the viaduct height was fluctuating very slightly, within a tolerance of one-sixteenth to one-eighth inches, the state reported. That meant that Bertha was exerting pressure on the soil in a controlled manner as designed, and that measuring devices are working, said Dave Sowers, deputy director of Highway 99 for the Washington State Department of Transportation, and a geotechnical engineer. “We’re encouraged to see that, as opposed to a flatline that doesn’t show any kind of movement,” he said Friday. The future four-lane Highway 99 tunnel, from Sodo to South Lake Union, is just over two years behind schedule, primarily because of a breakdown in late 2013 followed by extensive strengthening and repairs. The tube ought to be fully drilled by December, according to Ron Tutor, CEO of Tutor-Perini of California, one of the contracting partners. In a rare occurrence, car and bus traffic flowed at the speed limit on Highway 99 through Sodo and onto the northbound Viaduct at 8:30 a.m. Monday. But in all likelihood, congestion will return.